In the early 20s, a man never used to go outside without wearing a hat. 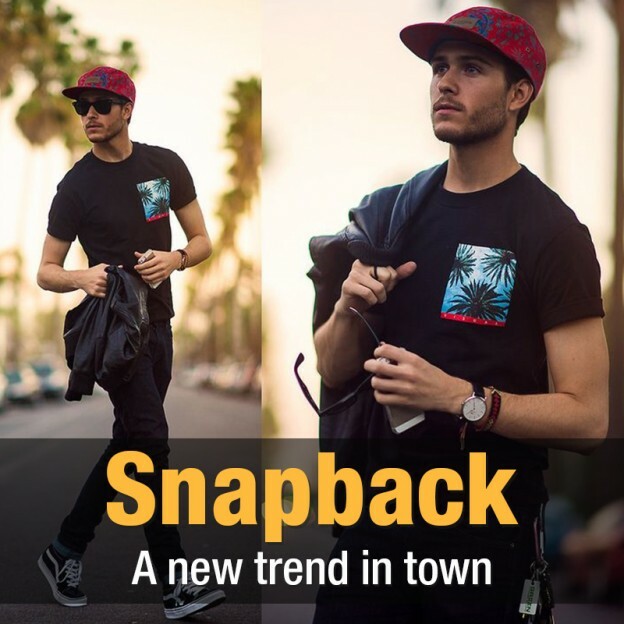 Besides so many styles of hats, men use to prefer wearing Snapback but somehow failed because they had no idea about styling them. But before getting along with styling this hat, let us first understand what exactly 'Snapback' is all about. The snapback is basically a baseball cap with a flat brim and is mostly styled by the New Yorkers. If you are styling this for the first time, go for the simple style. The one with a simple logo or a plain style on the front is a good start. The best part is, donning a hat is a great way to flaunt your style among your friends if they are not used to see you like this. Even basic colors won't mind such as camo, black and blue, they tend to fit it easily with your outfit. But, selecting the particular color totally depends on you. Whatever color you may choose, just make sure it goes well with your outfits. Apart from the colors, there are many designs and patterns too. Choose accordingly. When we talk about the material, snapbacks are made of polyester, wool, and cotton. You can also go for silk, denim or corduroy. Creating a casual look with a snapback is very entertaining and very versatile. You can pair it with a shirt or a tee with your jeans. Adding a hat to this outfit will make you feel comfortable with your style. But make sure it doesn't look boring. Let the brim of your hat pointing upwards instead of resting on your head. Show a bit of your hairstyle. So, if you are a hate lover and have great hair, this style is just made for you. Streetwear look means backward snapback style. If you are a fan of collecting streetwear brands, then this style is for you. But make sure you don't look like a cartoon character. Push your snapback backward properly and put them together with sneakers, a tee, and work trousers. Tip 1: Never show your ponytail, it is a fashion disaster. Tip 2: Never style your snapback sideways, just not a fashion thing. On That Note: Snapback are in trend for many years and they can never go out of fashion. So, make sure you style them confidently.